“House Votes to Outlaw Horse Slaughter,” by Libby Quaid, Associated Press, 7 September 2006, http://www.forbes.com/entrepreneurs/entrelaw/feeds/ap/2006/09/07/ap3001590.html (from Democratic Underground). “The United States is the world’s oldest and most successful multinational economic and political union in the world” – “50 members strong.” The founding fathers gave us the wonderful system of federalism, which allows Massachusetts to experiment with Left-wing governance, South Dakota to experiment with Right-wing governance, and everyone else to judge the success or failure for themselves. Federalism rejects the failed notion of Modernity — the idea that there is One Right Way For Everyone Best Decided By Experts — and instead returns decision making to distributed and (informally as possible) networked centers of control. But if you’re a House Republican, you don’t care about what those old fogeys thought, do you? The House brushed aside objections from horse doctors and the White House and voted Thursday to outlaw slaughtering horses for people to eat. The administration had the backing of the American Veterinary Medical Association and the American Association of Equine Practitioners, the biggest horse doctors’ group. The American Quarter Horse Association also supports the practice. Did the Congress, aware that horse-butchery was not an issue which Jefferson, Madison, & Co. were unprepared to trust the wisdom of distant federal officials, stay out of the matter, allowing the People in the several States to act? Did the Congress, aware that horse-butchery was not an issue which Jefferson, Madison, & Co. were unprepared to trust the wisdom of distant federal officials, stay out of the matter, allowing the People to directly act, supporting horse-butchery or not as was their conscious? 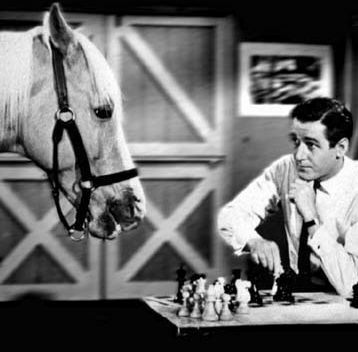 For that matter, did Congress realize that a literalist interpretation of Mr. Ed may lead to spurious laws? Nope. Instead a worthless, nanny-state law of the worst sort. Don’t Vote Republican. Vote Democrat. Public Choice Economics teaches us that there is a natural tendecy of elites that the longer they stay in power the more likely they are to work against the interest they are supposed to represent. Now clearly somebody could purposely slaughter up a pony and grill some stakes, and fight this in court. They could win. But it would cost them lots of money, and there is no american association of horse meat chefs to fund them. The president should veto it. The president should veto anything that is not constitutional. None of them seem to do so. I favour congressional term-limits to partially mitigate along with other reforms. This seems pretty trivial to me. I am sure this will be a ragingly popular measure. People in the USA are sentimental about house pets and horses. You could have 50 million abortions a year and you get fewer protesters than if you drowned fifteen kittens. It's nutty, but this is the country we live in. No politician can be expected not to grab at an easy way to get some cheap popularity. That is simply asking for too much from them. That Rove, tomorrow night's episode of the Daily Show can't come soon enough (assuming they are new again, I hope). BTW, do you have more faith in the Democrats in terms of federalist method, or is your vote just to spite the Republicans? In fairness to Msr. Rove, the White House opposes this insane law. I have no trust in Nancy Pelosi, a San Francisco protectionist, to be any better than the tired Republicans in the House. Then again, I have no trust in the House Republicans to be better than Nancy Pelosi. In that case, punishment isn't just spiteful — it's a teaching opportunity. How is popularity being measured? Is there any public outcry for this? If the House was doing anything worthwhile, then it might be trivilian. But in a Congress that has no achievements, what do we have except for these symbolic screwings of free trade and the Constitution? Hey, let's not get Karl's wife into this now. ;) Anyways, I think it has Rove written all over it. An attempt to dodge real issues that Republicans lack a significant mandate on while appealing to bleeding hearts between the right and left. This isn't going to work, but I have to give the guy points for creativity. Also, when you voice your support for free trade, do you mean the â€œWashington Consensusâ€ version, or the “even playing field” centre-left version? When I speak of free trade, I mean the consensus on global liberalism that is endorsed by such Democratic columnists as Tom Friedman, Democratic intellectuals as Tom Friedman, pro-Kerry European newspapers such as The Economist, Democratic candidates such as Senator Hillary Clinton, President Bill Clinton, etc. The same agreement on objectives is widely shared by influential republicans including George H. W. Bush, Newt Gingrich, George W. Bush, etc. This “Washington Consensus” has led to our adaption of multilateral institutions such as the North American Free Trade Agreement, the World Trade Organization, and the Central American Free Trade Agreement. In our our continent, it has been advocated by Canadian Prime Ministers of different parties, American Presidents of different parties, and Mexican Presidents of different parties. While fairness is a strong and natural human drive, I am suspicious of how it is sometimes used with the respect to trade. Protectionists easily invoke “fairness” to mean “they can't have any competitive advantages, but we can” — for instance, some may say that it is unfair for Mexicans to charge less, but perfectly fair for Americans to benefit from more reliable courts. There was a columnist in the Sun Times who was constantly imploring people to contact their reps to stop the killing of the poor horsies. I think there was a lot of that going on. I think it was a cause celebre for the people who are way into hugging animals. I, myself, don't get it. I'd eat horse meat in a second. If it was good enough for my Mongol ancestors, it's good enough for me, baby. Heh, I hadn't even listed how this is an example of Modernity v. Tradition. It's like the House Republicans wondered how many core principles they could betray in one act, and chose this bill as a test. Yippers. I beg to differ with you . . .